Medilink is currently deploying mobile medical services in Africa in some of the region’s most remote and extreme terrain. We are supporting a multinational team surveying a large tract of land between two central African countries. This type of project is no stranger to Medilink International as this assignment is just one of several in Africa we are engaged in. It does, however, highlight aspects of our work that often go unseen, yet are critical to ensuring the health and safety of our clients’ teams. Here, we outline some of the day-to-day work involved in deploying medical assistance in areas devoid of almost any on-the-ground, local medical support. 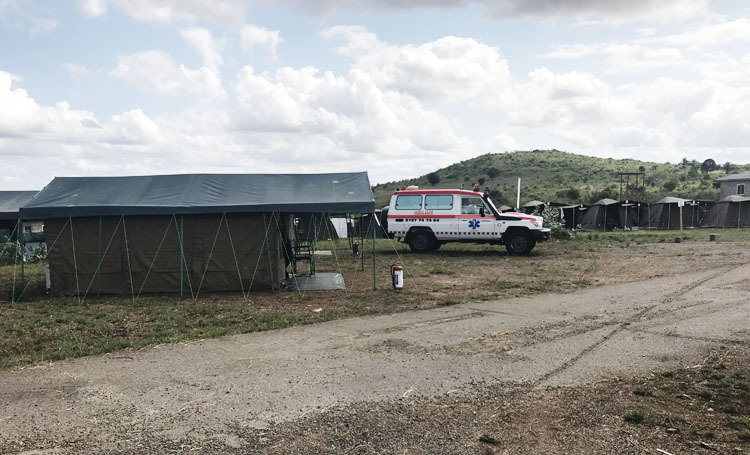 Medilink was required to provide fully mobile, yet highly-equipped medical services that could move in stages with the client team as they set up temporary base camps along the route. The entire operation was therefore ‘on the move’ and needed to be flexible, easily transportable, and still provide a full complement of appropriate medical supplies and services. We were able to deploy services in terrains which proved difficult at times even for 4×4 vehicles. On occasions, this necessitated Medilink personnel scouting the area a few kilometers ahead on foot to determine the safest and most viable route to take with vehicles. In addition, the regions we covered were prone to heavy rainfall and were snake infested which made negotiating the terrain extremely hazardous. At Medilink, we select medical personnel with the requisite experience of the environments in which our clients operate to ensure that we can pre-empt and foresee such difficulties. They are trained to put drilled procedures in place should an emergency evacuation be required. For this project, Medilink employed a team of over 15 doctors and nurses working in teams, along with a number of all-terrain ambulances. The field team was backed by staff from across the company. All departments, from logistics and finance to topside support and our emergency alarm centre in Malta, are involved in smooth running the remote mobile medical services required for this scale of project. Our field team was led by Dr Nuno Cosmelli, Medilink Senior Medical Advisor and a highly-experienced flight medic. Dr Cosmelli has over 20 years on the ground in Africa and is a specialist in emergency and aeronautical medicine. In total, we assigned 110 personnel to support a seven-strong client team. This figure gives an indication of the scale of mobilisation required to support clients operating in such harsh environments. The central African region covered in this project is susceptible to outbreaks of cholera, malaria and viral fevers such as Marburg fever. With Medilink’s health risk assessment prior to deployment identifying a severe lack of availability of any local medical services, we ensured our field teams were not only equipped with requisite medical supplies but were in constant contact with our Emergency Alarm Centre and topside team based in Malta. Medilink has developed detailed internal procedures to ensure field teams have the optimal back-up and emergency support on hand, 24/7. Dr Nuno Cosmelli providing community medical services. This particular project not only crossed national borders but also tribal and local community homelands. It was imperative that we were sensitive to their needs as the project moved through various territories. When and where possible, our medical staff assisted the local community by delivering primary healthcare. We treated cases of high blood pressure and conjunctivitis, as well as some instances of malaria and cholera. In this way, we are able to assist local communities who may be impacted by the project at a later stage. In conclusion, this central Africa project has been a win-win for all engaged. It was a massive undertaking in terms of the logistical aspects of deploying mobile medical services in this remote part of Africa and along such a vast corridor. 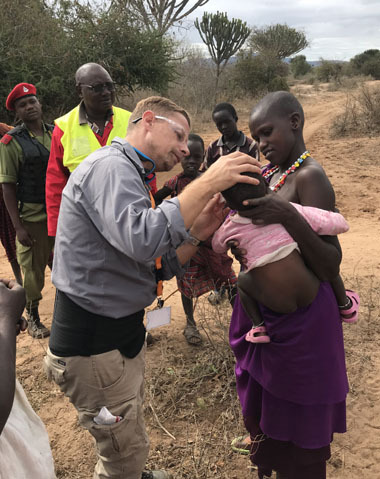 It is though a routine project for Medilink and just one example of many mobile medical services’ projects we run in similarly remote, extreme environments in Africa.